Enter the world of Chiba Sushi and find friendly staff and the best place in Victoria to get reasonably priced quality sashimi, sushi and cooked dishes. 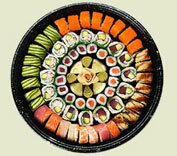 Sushi has been around since the second century. Initially, sushi was a preservation technique where fish was packed in rice, allowing the fish to ferment. During the 14th century people began to add vinegar to the rice to further enhance preservation. Today, sushi has adopted many new ingredients, techniques and forms. Both rice and vinegar are still common ingredients. In addition, today's sushi can include a variety of ingredients such as shrimp, crab, squid, tuna, mackeral, salmon and octopus, eggs, avocado, cucumber and more. 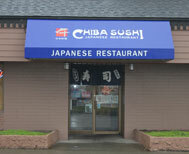 Chiba Sushi, located in downtown Victoria (corner of Government and Hillside) and features our Sushi bar and Tatami room with 65 seats. We have been in operation since 2007 under new a new chef and owners. Whether it's your first trip to the sushi bar, or a regular occurrence, we promise your visit to Chiba Sushi will be a delicious experience.